On 29 January, a March and Rally for Immigration Reform will be held in Pacoima, California, a city in the San Fernando Valley near Los Angeles. 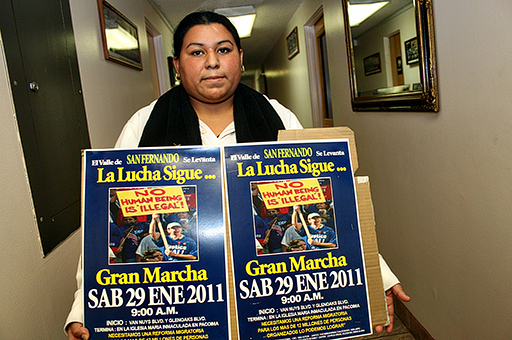 The event, organized by the Justice for Immigrants coalition in San Fernando Valley, will consist of a march which will proceed to the Oblate parish of Mary Immaculate. There, a rally will be held featuring speeches by community leaders encouraging elected officials in Congress to fix the broken immigration system and remind them of its impact on families. 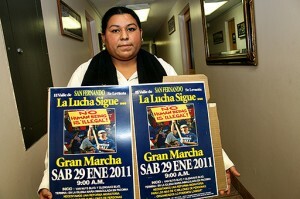 Read the Press Release by Justice for Immigrants Coalition /San Fernando Valley. In a separate but related action, the Oblate JPIC Office has joined 45 other faith-based organizations in issuing a declaration in support of Migrants. The Resolution on Migrants was developed in observance of National Migration Week, declared by the US Conference of Catholic Bishops’, and recognizes the difficulties facing immigrants in the United States today. The diverse array of faith groups signing onto the statement are united in their concern for the plight of immigrants and the current negative political atmosphere in many communities. Most of the faith-based organizations endorsing the Resolution represent individuals and communities who live among and serve the immigrant population and are witnesses to the daily struggles of immigrants. The U.S Migrant Resolution shows that a diverse faith community remains committed to immigration reform despite the current lack of political leadership. We hope that Congressional leaders can reach across the divide on this issue in the same way that the faith community has come together.